FIND YOUR WAVE® is more than a slogan, it is a way of life for surfers. It is a rally cry for each of us to find what brings us joy, healing and freedom. 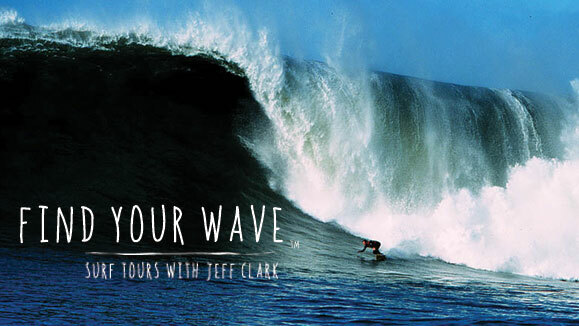 Jeff Clark has spent his lifetime at the ocean, in the ocean, and in search of waves. "It is my sanctuary," he says. He found his wave. If you or a group is interested in customized surf and SUP trips to explore new waves around the globe or here on the west coast, we can help! Jeff is available for private coaching, guided surf trips and private tours customized anywhere in the world (maximum of 8 people). Contact Us to help plan your next surf adventure.